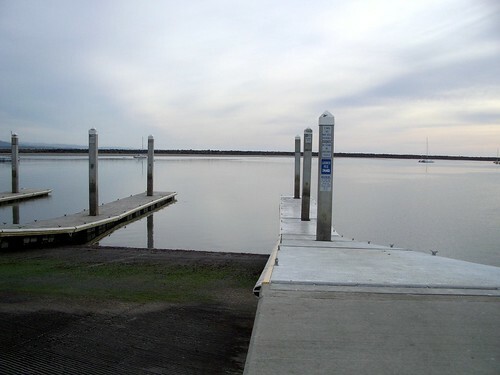 Public boat launch area at Pillar Point harbor. There were people digging big holes in the beach near the boat launch area; I gathered that they were looking for seafood, but I'm not sure what kind of seafood. It was partly sunny most of the time I was there, but I understand it was raining farther inland. I saw a lot of interesting clouds. I went for a short walk at Pillar Point Marsh. There's also a beach nearby where people take their dogs to play. 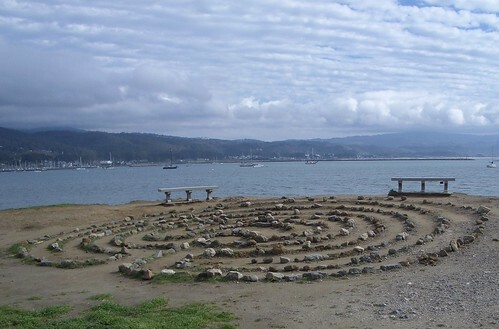 This labyrinth was between the marsh and the beach. I cropped this photo four different ways and I can't decide which one I like best. If you click through to my Flickr you should be able to see the four photos. 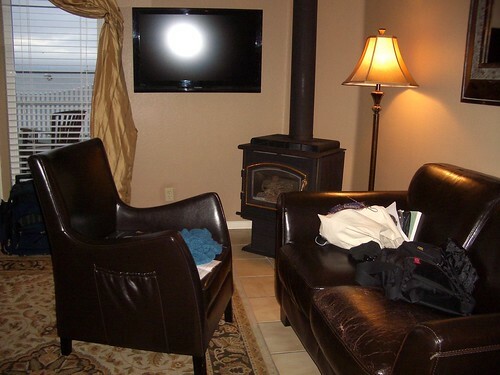 The "watching TV and knitting" part of the vacation took place here. We haven't had TV reception to speak of at our house since we got our new roof put on and removed the satellite dish (although the OH did manage to get about six local channels by hooking the cable up so it served as an antenna). I didn't realize it but I guess I was kind of hungry for TV. On PBS one evening I became the last person on the planet to discover the show Life on Mars (the British version) and I really liked the episode I saw, so I put it on the Netflix queue. That same evening I saw the Serena Williams/Victoria Azarenka quarterfinals match of the 2010 Australia Open. The next evening I watched most of the 2008 VH1 top 100 hip-hop songs countdown and discovered how woefully small my hip-hop knowledge is, because I had only heard about ten of the songs before. The final evening I watched three episodes of Wild Russia on Animal Planet, then I found various episodes of the kind of show where they take you to farms and factories to show you how things are made. One show featured the elements of a Chinese takeout meal (Peking Duck, soy sauce, oyster sauce, the takeout box, and the fortune cookie) and another featured potato products. A pair of socks from Ditto yarn "Purple Cascade"
OMG OMG see the UK version, like RITE NAO. It is one of my favourite things EVAR. 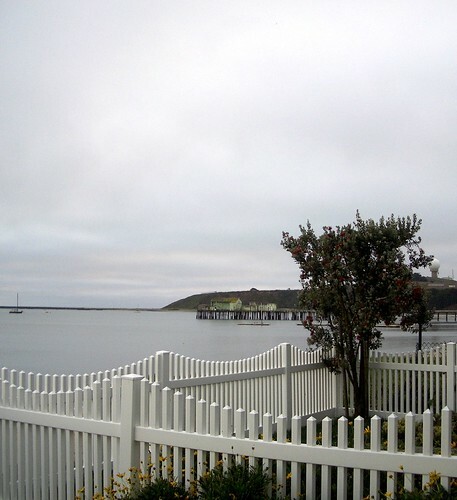 Jennie lives right near Pillar Point Harbor. I've thought about staying at that Inn and visiting her for longer than a day trip as a mini vacation. But we both need a bit more time for that. Currently her life is Quadruple packed, and she's home schooling. They might have been digging for clams. 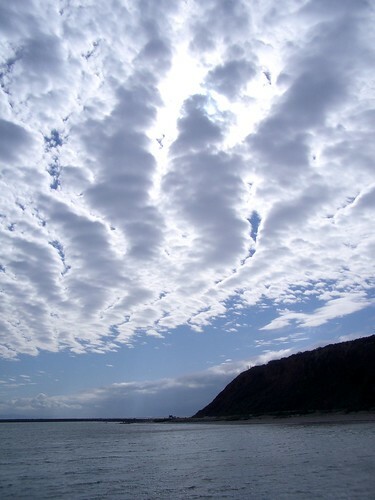 I love your pictures of the clouds. The whole vacation sounds lovely. Loved the comfort of your vacation. 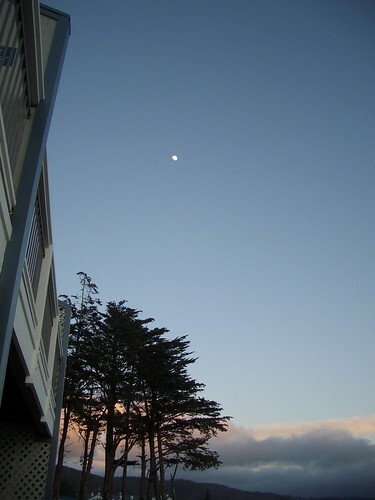 I mean to get away to the Oregon Coast soon, maybe near the pebbled beach. Going on vacation by myself sounds pretty awesome- I may have to try it some time. Especially love the labyrinth photo.